There are quite a lot of recipes I wanted to choose but I thought I'd stick with something simple and easy and that I don't just make at Halloween but I normally make all year round. 1. Roll out your pastry until the correct thickness is achieved and line the pastry dish with it, blind bake it for 10-15 mins until the pastry is half-cooked. 2. Peel, take out the core and slice the apple. Take the pastry out the oven and let is cool slightly. Then place the sliced apple in the pastry dish until the bottom is covered. 3. Sprinkle cinnamon on the top of the apple. 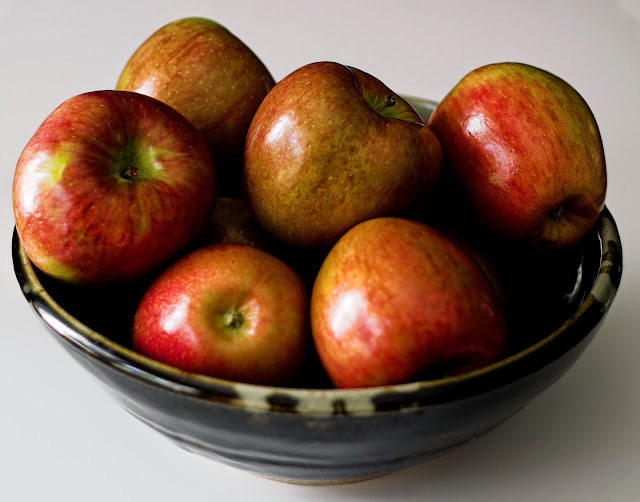 Depending if you used cooking apple, you might want to sprinkle some sugar on top as the cooking apples can be sour. I sometimes use brown sugar as it gives it a caramelised taste. 4. Pop the top part of the pastry on top. If you have any left over pastry left you can make some pastry leaves or something to decorate with. 5. Pierce a fork through the top in a few different places to let steam escape. 6. To give the pastry a more golden colour - you can use an egg-wash on top before baking. 6. Pop in oven until pastry is cooked on top and brown. > Use mixed spice instead of cinnamon, or you can try nutmeg aswell or just plain apple! > Instead of using pastry to make a pie - make a crumble.